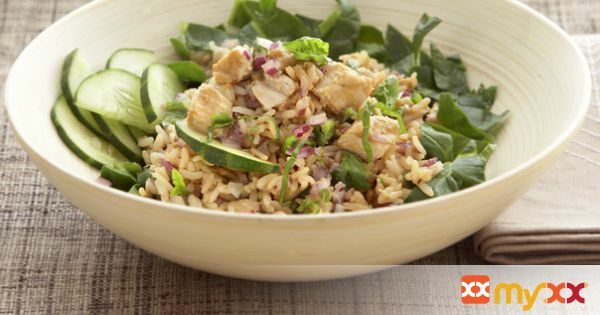 Peanut butter, ginger and fresh basil bring out the Thai character of this tasty rice-and-chicken salad. 1. Cook the rice according to package directions, set aside and chill. 2. Whisk the peanut butter, vinegar, oil, soy sauce, sugar, ginger, garlic, and poblano peppers in a small bowl, set aside. 3. Cut the cucumbers in half lengthwise before cutting them into 1/2-inch slices. 4. Combine the rice with cucumber, dressing, chicken and onion. Cover and chill. 5. Just before serving, toss salad with spinach and basil.